MS is a sneaky condition. 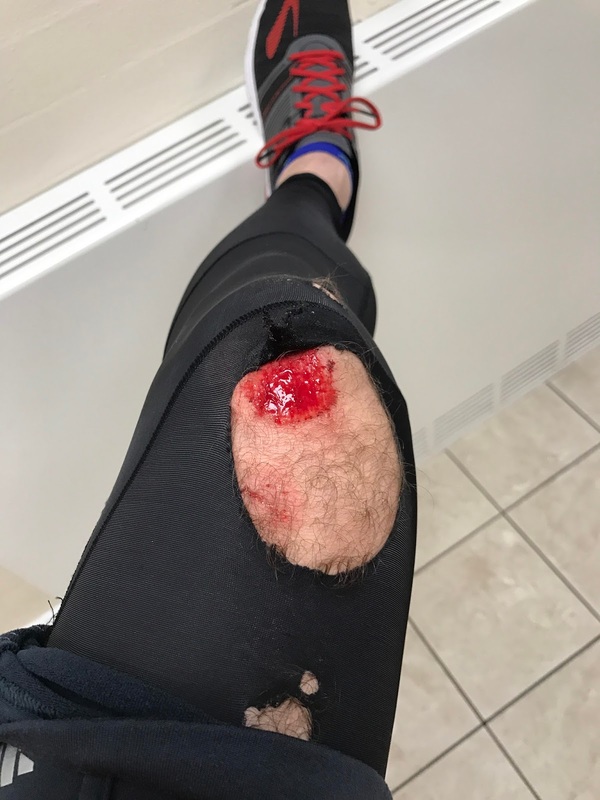 Yesterday, I was running a half marathon and generally feeling on top of the world; today I set out to run a quick 5km with my running club to loosen up my surprisingly-stiff muscles and I took a bit of a tumble. 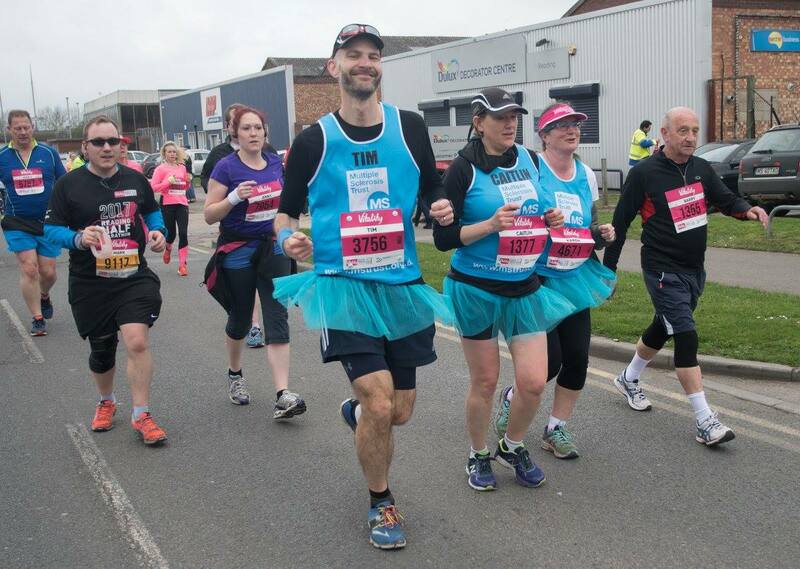 It was the Reading half marathon yesterday and I ran round in support of my friend Karen. We've been blog buddies for a while now, so it was a pleasure to run round the course with her. I ran this as a warm-up race for London marathon in 2015, and C. and I managed 2:06.... it was my slowest half marathon ever, but it was also the one that I have enjoyed the most. Yesterday, we managed around 2:45 and I think I enjoyed it even more (I had a beer at the drinks station outside the pub at about 8.5 miles, for starters...). 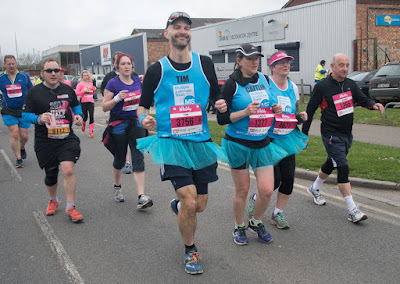 Clearly, I am capable of running much faster than that, but I was happy to do everything I could to support my friend around the course as she raised good money for the MS Trust. Karen found it tough going after around eight miles, but she showed some real guts in getting the job done without a word of complaint and I'm full of admiration. It was a good day; much more tiring than I was expecting, but it was a really good day. I'd been tired and stiff most of the day, but I was determined to get out for a run tonight, even if it was only for a slow 5km. Normally, when I fall (and it happens to me more than I'd like), it's because I drop the foot on my weaker left side and start to scuff and trip. This time, I had no warning at all and just went straight down on my left side like I'd been shot. Tired muscles from yesterday, I suppose. There's no real harm done beyond a scuff on my knee, some bruises on my wrists and knuckles (I like to think my cat-like reflexes ensure I do a mean ninja roll as I hit the ground, which would perhaps explain the red, angry looking marks on my left shoulder)... but I really hate being reminded that I'm not bulletproof and that this condition is slowly taking a toll on my body and on my running. I'm not stopping running, obviously... I ran a half marathon yesterday, did I mention? I probably just need to be a bit more careful and take things a bit easier (stop laughing at the back!) I've also got a pair of insoles and an ankle cuff that are designed to try and stop me dropping my left side as I run, but I left them both at home today. I suppose using them when I run would be a reasonably good starting point, eh? As I stood in the shower and noticed the marks on my left shoulder, it dawned on me how hard I must have hit the ground and actually how lucky I was to have got away so lightly. Ask me how I feel tomorrow morning, but given that one of my running friends fell over last year during a race and broke his elbow and another fell over the other week and lost one of her front teeth as she face-planted onto the road, I've been pretty lucky. Thanks goodness for sapphire crystal Garmin screens too, eh? I'm also very grateful to all the wonderful members of Rebel Runners who showed me so much concern this evening and offered me (and my bike) lifts home and things. It's a lovely running community and it was joining them in 2011/12 that completely changed my running life, so I already owe them loads. Thanks guys. It's very much appreciated. Honestly. Good job it's nearly summer...those leggings are ruined! Ouch! If you're going to make a habit of falling over maybe some knee pads etc. are in order?